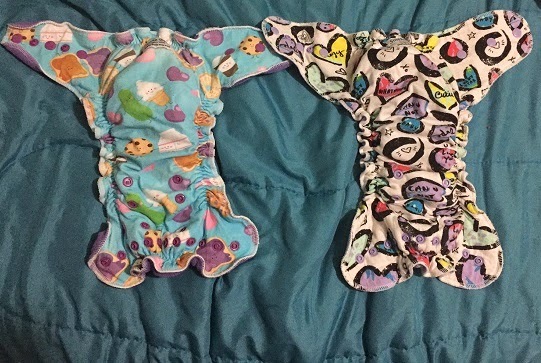 I am so excited by all the feedback from my previous post - My Cloth Diaper Experience. Multiple people wanted to know more about my favorite brands and types of diapers so I figured a follow-up post was in order. I will only buy a diaper new/retail if I cannot find it on the Facebook Cloth Diaper Swap, or the Babycenter.com Cloth Diaper Swap. You'll save a lot of money on the swap boards, and it's also nice to help out other moms who are trying to monetize their unneeded diapers. I also sell my unneeded diapers on these boards. If you buy used, throw a 1/4 cup of bleach in a couple gallons of water and let the diapers soak for 30 minutes before washing them. If you're diapering a newborn/infant you want to have about 34 changes if you want to wash every two days. If you're starting with an older baby, I would say start with having the same number as you use disposables per day. Sage goes through 6-10 diapers a day. She's currently nine weeks old. There are One Size diapers and there are sized diapers. Kinda like Small, Medium and Large clothes, vs. One size fits all clothes. Snaps, or a combination of snaps and velcro allow you to adjust the sizing. If you are starting from newborn you will likely need to buy some newborn sized diapers, and then you will move on to One Size or sized diapers after baby gets bigger. We moved into One Size diapers around six weeks. These One Size diapers will hopefully take her all the way through her diapered life. The type of cloth diaper the most easy to use are called All in Ones. These diapers function the most like disposables. They have snaps or Velcro to easily put them on and take them off. My favorite brands of All in One Diaper is Blueberry Simplex and Thirsties. If you have a childcare provider these are usually the only type of cloth diapers accepted by daycare centers. The third easiest type of diaper I own are fitted diapers. These diapers require two parts. A cloth portion that fits and snaps like a disposable, and a separate waterproof cover to go on top. My absolute favorite type of fitted diapers are Green Mountain Diaper Workhorses. And my favorite waterproof covers are Blueberry Diaper Coveralls. I should also note that the diapers in the photo above are also fitteds. Those are my two overnight diapers and I purchased them from a WAHM (work at home mom) on Etsy - Soothebaby. Another type of diaper, the fourth easiest, that is used with a cover is called a pre-fold. You can do fancy folds with a prefold or just tri-fold it inside of a cover. That's what we do. Using pre-folds and covers are the absolute cheapest way to cloth diaper. Note that I ranked these all easy, because no type of cloth diaper is really that hard. We very rarely have leaks. In my personal collection the two diapers that I can compare to disposables are my Bumgenius 4.0 pockets, and my Soothebaby fitteds. The others have good absorbency but get very wet on the inside, so I don't leave her in them long. First: she's 9 weeks already?? No way! My experience with cloth is limited to when I did mission work in Zambia. They weren't concerned about fit so they leaked all the time. I believe they were the type with cloth and then a rubber cover. I had mixed feeling a leg cloth diapering after that, but this gave me a better idea. Yea, even the best diaper with a bad fit is gonna give leaking problems.